Babies are born every day--plenty of them on or close to big holidays. When you have so many other things to get ready for, it can be easy to unintentionally skimp on your little one's special day. To make sure you don't miss a thing, we've got some tips on how to make sure your guy or gal shines, even at hectic holiday-time. 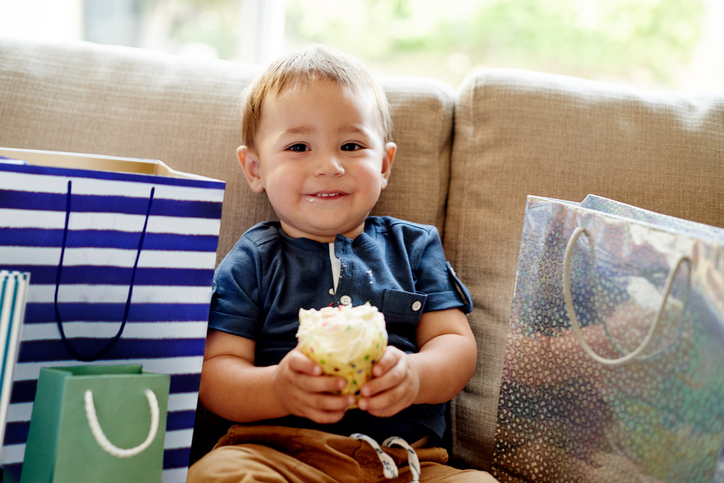 If your child's birthday falls on or close to a gift-giving holiday, don't succumb to frugality. Make sure you have holiday gifts and birthday gifts clearly separated so that your little one doesn't feel like she's not getting her fair share. Holidays are important, but not as important as your little one. Let your child know that your focus is on her on her special day. As often as you can, make sure you call the day, "your birthday" instead of," [holiday.]" Birthdays are hugely important to kids, so remember to show them it's important to you, too. If your child's birthday is on one of the really big winter holidays, it's easy for his birthday to be overshadowed by seasonal events. Celebrating a half-birthday party in the summer can be just the thing to make your little one feel as special as he truly is. Have a small family-only party on the actual day, but save the big party with friends for the summer. If a half-birthday isn't your thing, host the big party a week or two early (or late). It's hard to get friends and family to commit to a party when they have so much to do for the holiday, too. Let your child's birthday party be the intro to the holidays, or the grand finale. Make sure to get any invites out at least two to three weeks early. That way you'll give everyone plenty of time to plan for your child's big day. Many families tend to overschedule themselves around the holidays, so getting your kiddo's event on their calendars early will make sure everyone shows up to celebrate. Does your child's birthday fall on one of those big dinner holidays? Have a birthday breakfast, instead. Let your child pick special breakfast foods and wear a party hat first thing in the morning. Starting the day with the focus on your child will help her feel like it's still her day after all. If it's one of those holidays when you're supposed to have turkey, ham, or something else traditional, let your child pick a few surprising additions. Pizza and hamburgers are an unusual choice for the holiday table, but for your child's birthday, they're a fun option. Holiday decorations can make your house feel fun and happy, but they can also distract from your child's day. Pick one room and keep it clear of any holiday decorations. When it's time to celebrate your child's birthday make sure you deck the room out in as much birthday fun as you can. Your little one deserves everyone's undivided attention for her birthday. No matter how tempting it may be, don't hold a holiday-themed birthday party. Let your child's party stand on its own so your kid doesn't feel like she has to compete. It might take more time and effort, but it's worth it. No matter what holiday it is, be sure to make it all about the birthday boy or girl. We only get to make a huge deal out of our kids' birthdays for a limited amount of years—holiday traditions can wait.